Heart disease is the leading killer in the United States and the obesity epidemic is spreading throughout the world. Because of this, a lot of people are taking steps to cut fat from their diets. What they don’t realize is that cutting fat from your diet can actually harm your health. You can read more about why you need fat here. Fats from plants are healthy. Fats from animals are unhealthy. Of course there are some exceptions to this rule – like with fish being touted as a healthy source of fat (though not as healthy as it is hyped up to be – read why fish isn’t healthy here). Compared to animal foods, plant sources of fat tend to be very high in the healthy monounsaturated and polyunsaturated fats. When plants have high amounts of saturated fat, it tends to be the “good” form of saturated fat. Since plants are also loaded with nutrients like antioxidants and fiber, they also have health benefits beyond their fat content. If you are interested in losing weight, read about the vegan diet for weight loss here. Here are 7 of the healthiest fats from plants that you should start eating for a healthier life! Flax seeds are considered superfood because they contain a huge amount of healthy Omega 3 fatty acids, and also have one of the best Omega 3 to Omega 6 ratios. 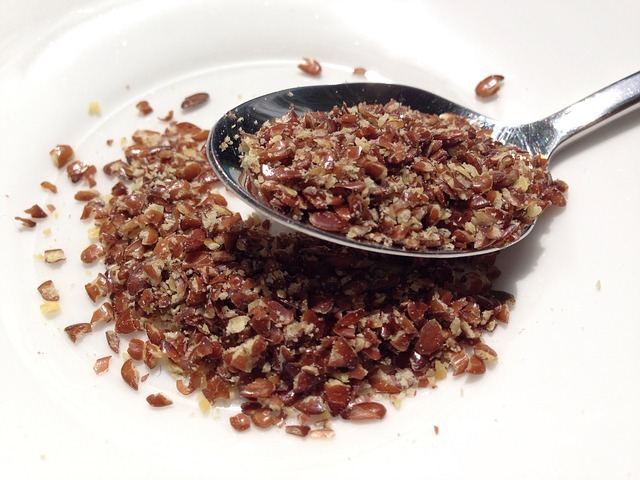 A single ounce of flax seeds packs in 6388mg of Omega 3 – nearly 6x the RDA! Flax seeds do contain some saturated fat, but it is the stearic acid form of saturated fat, which gets converted into the heart-healthy monounsaturated fat in the body. Flax seeds are also great sources of protein, calcium, iron, fiber, and polyphenol antioxidants. How to use flax seeds? Add them to your morning cereal. Use flax meal in place of some flour when baking. You can replace cholesterol-laden eggs with a “flax egg” (3 tbsp flax meal + 1 tbsp water = flax egg). In the 90s, I had a Chia Pet. I should have been eating the seeds instead of slathering them on a ceramic turtle! Like flax, chia seeds are loaded with Omega 3 and have a great Omega 3/Omega 6 ratio. They are also great for your bones as a single ounce has 18% of your calcium RDA. Use chia seeds to make puddings, in smoothies, or in your morning cereal. All nuts are a good source of healthy fats, but almonds are one of the best. Per ounce, they contain fewer calories than walnuts, cashews, peanuts, and hazelnuts, yet more protein. Almonds also top the chart when it comes to calcium, and are loaded with iron, B vitamins, magnesium, copper, and zinc. They are loaded in vitamin E which, because of the dietary fat content of almonds, your body can actually absorb (vitamin E is fat soluble!). As far as fat goes, almonds contain high amounts of monounsaturated fats. Eat almonds as a snack, add them to cereal, blend almond butter into smoothies, put slivered almonds on salads, or make “cheese” out of soaked raw almonds – like in this recipe. Tahini is made from sesame seeds, which are comprised of about 50% oleic acid. This monounsaturated fat is considered one of the healthiest fats because of its ability to raise blood concentrations of HDL (good cholesterol) while lowering LDL (bad cholesterol). It also promotes antioxidant production which can fight inflammation and heart disease. No wonder the Mediterranean Diet – a region where they eat lots of sesame products – is considered so heart healthy! Sesame seeds are also a fantastic vegan source of calcium and iron. Try making salad dressing from tahini or sesame oil. It will give you a dose of healthy fats and also help you absorb the fat-soluble vitamins in your salad. About ¾ of the calories in avocado are from fat, which make them one of the fattiest natural foods you can eat. For this reason, a lot of people recommended against eating avocados for weight loss, but avocados are actually rich in the type of healthy fats that you want in your diet – especially for losing weight. The fat content in avocado breaks down into about 68% monounsaturated fat, 13% polyunsaturated fat, and 15% saturated fat. The huge amounts of LDL-lowering unsaturated fats in avocado can account for why the fruit is proven to lower bad cholesterol levels and the risk of heart disease. Monounsaturated fat is easy for the body to use, which also makes it a great source of energy. The high amount of saturated fat in avocados might be a concern to some but, because avocados are so loaded with healthy fats and have anti-inflammatory properties, they cancel out any risk which might be posed by the saturated fat. 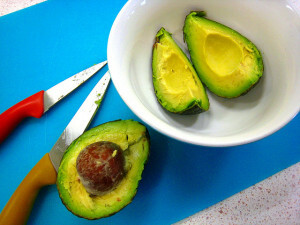 Use avocado in place of mayo, butter, and other unhealthy fats. Put them on your salads and you will increase absorption of fat-soluble vitamins your body needs! When it comes to cooking oil, olive oil is one of the healthiest options. For starters, it is a great source of monounsaturated fat – which is considered the healthiest of fats. Other types of oil also contain healthy fats, but they usually contain higher proportions of polyunsaturated fats, which oxidize more easily. Olive oil also contains high amounts of antioxidants which prevent it from oxidization. Remember, when oils burn, they can become toxic. So, if you are going to deep fry something, you might want to use sunflower oil instead which has a smoke point of 440°F (227°C) compared to extra virgin olive oil which has a smoke point of 320°F/160°C. Coconut oil is 92% saturated fat, which may make it seem like it is bad for your heart. But the saturated fat in coconut oil is mainly lauric acid, a medium-chain triglyceride (MCT). When you consume MCTs, your body delivers them directly from the intestines to the liver where they can be burned off as fuel, thus raising your metabolic rate and giving you a dose of easily-usable energy. Unlike with long-chain triglycerides, the MCTs are less likely to be stored as fat. A huge list of health benefits have been associated with lauric acid, including: weight loss, lower cholesterol levels, and reduced risk of heart disease. There is also ample evidence for lauric acid as a natural antiviral, antibacterial, and antifungal (I gargle with coconut oil and baking soda when I feel a sore throat coming on). There isn’t too much info to support some of the more outlandish claims about coconut oil benefits — like it will cure AIDs or prevent Alzheimer’s disease – but it is definitely a fat you want to add to your diet in moderation. Use coconut oil when baking sweets, add it to your smoothies, or use it in natural beauty treatments – it makes a great makeup remover! Lastly, make sure you’re using pure coconut oil. There are a myriad of coconut oil products on the market, which makes it difficult to avail high-quality pure coconut oil. 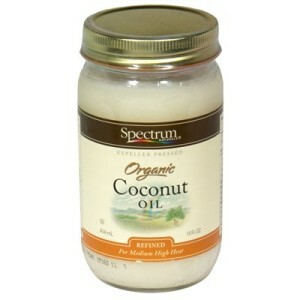 Pure coconut oil differs from refined or impure coconut oil, and is a far superior product. Here are 64 Reasons to Use Pure Coconut Oil! I personally use Viva Labs Organic Extra Virgin Coconut Oil. Want to add more healthy fats to your diet? Look at our recommendations for Omega 3 and healthy fatty acid supplements here. It is always best to get your fat through food first and not supplements. But, if you are having trouble eating healthy, here are just a few healthy fat supplements to consider taking.